Welcome to the Eureka Springs City Auditorium. Built in 1928 The Aud has provided the community members of the City of Eureka Springs and its visitors many opportunities for special entertainment. The venue has created energetic moments with bands like Little Feat, Dr. John, Richie Havens and shared some sweeter moments with performances from the Ozark Chorale, the Opera of the Ozarks and area school programs. The building has been filled with laughter from the likes of The Smothers Brothers and BB King. 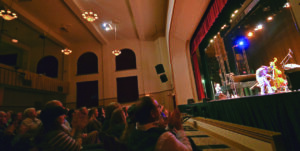 Area dance and theater groups have graced the stage with local productions and the venue is always used for the headlining act for the city’s many festivals. Showing films and hosting town hall meetings are just some of the ways The Aud has served the Ozarks for centuries. The Auditorium is supported by The City of Eureka Springs and managed by the City Advertising and Promotion Commission. With just under 1,000 seats, The Auditorium is the perfect venue for corporate events, lectures, musical performances, plays and other special events. Promoters, non-profit organizations and artists and musicians are encouraged to use the facility by the CAPC offering reasonable rental rates and promotional support. See the About page for more information.